Provides nearly twice the effective privacy as traditional 3M Black options and provides 14% higher viewing clarity. 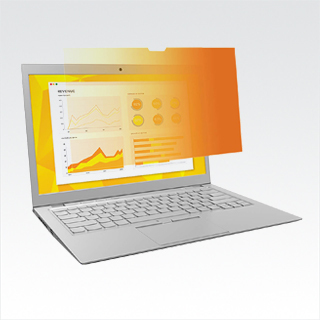 The Gold filter differs from the Black options by also protecting data from above as well as either side and displaying a Mirror-like reflective effect protecting confidential and private information from unwelcome eyes. Reversible, privacy filter can be used with either gold or black side facing the user. Lightweight, thin, frameless design. Protects display from dirt, debris and scratches. Cleans easily with a soft cloth and water.